>> How Much are Wine Coolers? Don’t Spend Too Much! How Much are Wine Coolers? Don't Spend Too Much! How much are wine coolers? A frequently question asked by those who have just understood the advantages of keeping their bottles in a dedicated refrigerator. With a host of wine coolers on the market, the answer is more complex than it seems. In broad lines, a wine cooler can cost anywhere between $50 and $8000. The lower end of the spectrum comprises home-use appliances that can accommodate up to six bottles of wine. At the higher end, there are industrial wine coolers that recreate a cellar-like environment and that can accommodate hundreds of bottles. Then, there is a distinction between thermoelectric and compressor wine coolers. Whether the model is freestanding or built-in also has an impact on the price. Here’s what to expect to pay for a good quality wine cooler for home use. How Much are Freestanding Wine Coolers? Freestanding wine coolers come in a wide range of sizes; their capacity varies from 4-bottle to +100-bottle appliances, although residential users mostly invest in refrigerators with a capacity between four and 36 bottles. The 36-bottle capacity is ideal for those wine lovers who need space to grow their wine collection but who don’t want to spend a fortune on the appliance. The average price of a simple, single-zone freestanding unit is $170 but the price range goes from $60 to $300. On the lower-end spectrum, there are small wine coolers with a single temperature zone and a capacity up to 8 bottles. The higher end includes wine coolers with a capacity up to 36 bottles and dual temperature zones. 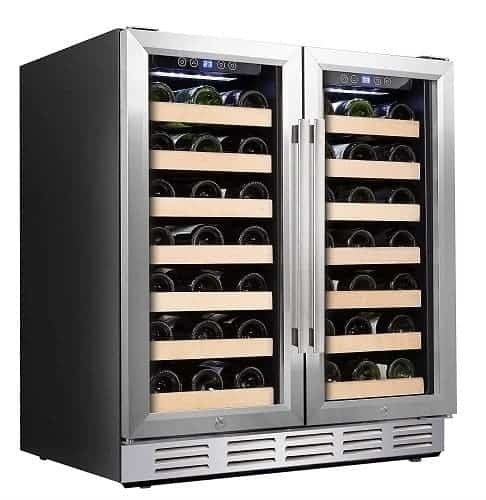 If you’re looking for a sleeker wine cooler, maybe a model with French doors or with a capacity above 36 bottles, the prices start from around $400 and go over $1000 depending on the capacity, brand, and features. How Much are Built-in Wine Coolers? 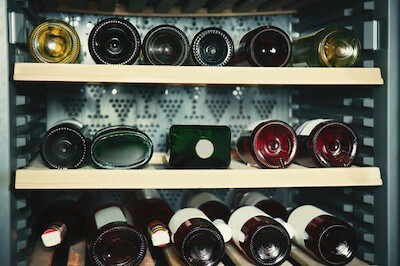 Built-in wine coolers offer a clear advantage over the freestanding units - you can mount them in or under a cabinet. A solution that saves floor space and that is ideal in a small home. Built-in units also help you create a flawless look in your kitchen, integrating the cooler into your furniture. Yet, this advantage comes at a higher cost. This is in part due to the higher capacity of the appliance. Then, built-in refrigerators are engineered differently than the standard freestanding units, and this is reflected in the retail price. On average, a built-in unit for home use will cost you around $600. Most built-in wine coolers have a capacity of at least 18 bottles, and you can expect to pay around $400 for such a unit. Prices go over $1000 for appliances with capacities of 30 bottles or over, or for those with double doors. Like the freestanding units, dual-zone built-in wine coolers are more expensive than their single-zone counterparts. How Much are Compressor Wine Coolers? Compressor wine coolers use the same refrigerating technology as food refrigerators and are very efficient in maintaining your wines at a constant temperature and humidity. Compressor units do an exceptional job at keeping your bottles in a safe environment regardless of where you live, but they tend to be a little more expensive than their thermoelectric counterparts. Compressor wine coolers come in a wide range, with capacities that go from 4 to over 100 bottles. 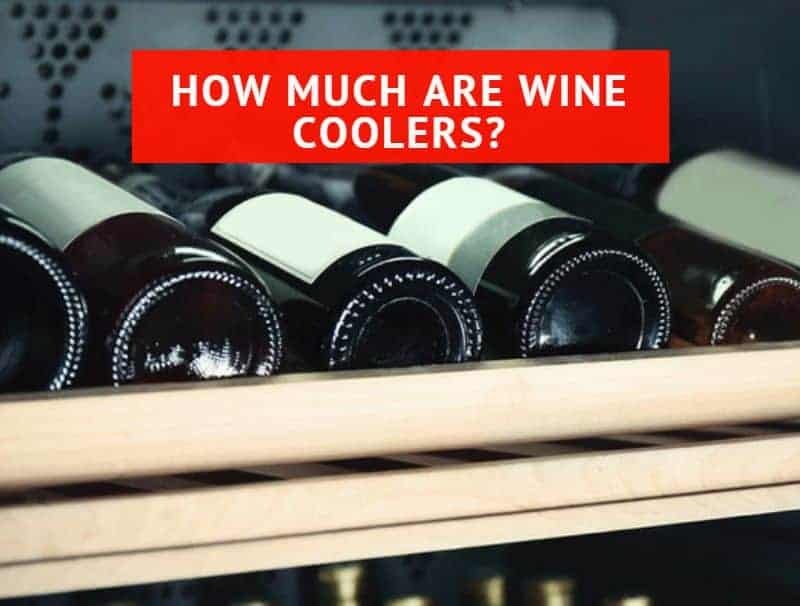 The most popular compressor wine coolers for home use have capacities between 8 and 50 bottles and on average, you can expect to spend around $325 for your unit. In detail, units with a capacity of up to 8 bottles rarely cost more than $200. Units with capacities up to 50 bottles usually don’t exceed the $500 threshold, but prices can vary widely for larger units. How Much are Thermoelectric Wine Coolers? Thermoelectric wine coolers come with advantages and disadvantages. On the bright side, they are quiet and have a low level of vibration which doesn’t disturb bottle sediment. They are also greener and save more energy. On the downside, thermoelectric wine coolers do a poor job in maintaining the temperature constant and don’t perform well in hotter environments. However, thermoelectric wine coolers tend to have the best prices on the market. If you live in a cool climate area, then such a unit could be ideal for you. On average, a thermoelectric unit may cost you around $170 and it’s quite easy to find bargains. Some 18-bottle units, for instance, cost less than $120 but you’ll have to settle for a single temperature zone. Yet, 18-bottle dual-zone coolers usually cost under or around $200, which is still a great deal. On average, larger units with a capacity between 30 and 40 bottles can cost you around $375. Finding a thermoelectric unit with a capacity over 36 bottles is rare though, due to the cooling technology that performs better on the small units. How much are wine coolers? How much will you spend on your dream appliance? It depends. If you want to showcase and preserve a small selection of valuable bottles, a small unit with a capacity under 8 bottles may cost you under 100 bucks. 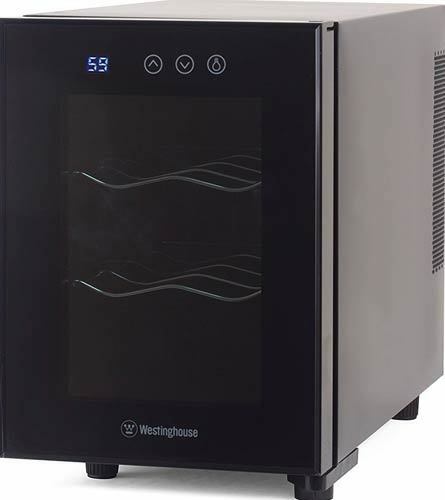 Larger units are more expensive - as one could expect - but if you’re happy with investing in a thermoelectric single-zone wine cooler, around $200 may get you a decent appliance with a capacity of around 18 bottles. Compressor units are typically more expensive but they are worth an investment if you need a larger unit or if you live in a warmer climate. Then, there is an important difference between the freestanding and the built-in units, with the latter being more expensive. If you’re now unsure which unit is right for you and which to buy, check out our comprehensive guide to the best wine coolers on the market, containing appliances from all ranges ideal for home or professional use.